Medical Thermography is a system using a highly technical and non-contact infrared camera to capture and record temperature variations on the skin, the largest organ of the body. As such, the surface of the skin provides vital information that is directly influenced by complex metabolic and vascular activity, including micro-circulation, below the surface via the sympathetic nervous system. Thermography does NOT see or diagnose cancer. These patterns of activity vary in intensity and distribution over each body region, represented by images with variation in colours. Detection of variations in skin temperature allows for recognition of asymmetric, abnormal or suspicious thermal patterns over a specific area or region of interest. Changes of these patterns may be recognised by the interpreter as abnormal physiology or function. Reports are based on study guidelines that are based on, but not limited to, side-to-side temperature, intensity measurement and comparison, established thermological signs including pattern recognition and comparison of changes over time. This method of analysis allows objective clinical correlation by the patient’s physician and contributes to the decision-making process regarding therapy, additional testing and eventual diagnosis. 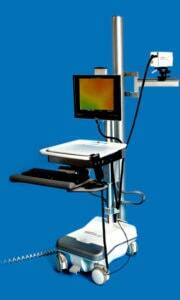 Thermography is an adjunctive test and does not replace mammography or any other anatomical imaging test. A negative thermogram, mammogram and/or ultrasound does not preclude biopsy based on clinical condition. The value of thermography as a screening tool is the non-invasive nature of the test and the unique ability to accurately measure skin temperature changes. Such monitoring affords detection of even subtle thermal changes that, although not independently diagnostic, may precede anatomical findings by years and prompt early investigation and prevention. As there is no single known test capable of monitoring all complex anatomical and biological influences of disease; monitoring with additional testing such as ultrasound, MRI, mammography or other testing as recommended by the patient’s personal physician is always advised. This scale is used for breast evaluation purposes. It is noteworthy that the TH system is not a comparative rating to BIRADS TH-1 Symmetrical Bilateral – Non Vascular (non suspicious, normal study) TH-2 Symmetrical Bilateral – Vascular (non suspicious, normal study) TH-3 Equivocal – Low index of suspicion TH-4 Abnormal – Moderate index of suspicion TH-5 Suspicious – High index of suspicion. Studies provide adjunctive clinical information and recommendations based solely upon the images and patient information provided, to support the patient’s physician in medical or health evaluation. All findings in this report are considered by the interpreter to be related to the general health of the reported region. A “Thermographically Suspicious” finding in this report does not indicate that it is suspicious for any specific disease. However, any suspicious finding will be accompanied with a strong and intentional recommendation for further clinical evaluation. This report should be presented to the imaged patient’s personal physician to determine the nature of the appropriate follow-up course of action /evaluation. Additional follow-up thermal exams for comparison are strongly recommended. The thermographer and the reporting thermologist are not responsible for the failure of the imaged patient or the patient’s physician, to follow recommendations set forth in the report. Patients presenting with previously diagnosed cancer The value of thermography as a screening tool is its non-invasive nature and the ability to measure skin temperature changes. The skin is the largest organ of the body and as such provides vital information. This information is directly influenced by the constellation of metabolic and vascular activity known to contribute to the inflammatory milieu facilitating development and progression or regression of the disease. However, thermography interpretation does not include information or recommendations related to the measured changes of disease beyond skin temperature changes and patterns. As there is no single known test capable of monitoring all biological influences of the complex disease generally diagnosed as cancer, continued monitoring with available additional testing as recommended by your personal physician is strongly advised.